NextReports will reach a new version soon. A new year, a new major version. When I see 7.0 I have to say I am overwhelmed that NextReports starts its seven year. Looking behind, every release brought something new to make NextReports a tool for everyone. Evolution was not a process to push features just to have them (because others have), but a smooth and natural process to help our users needs. 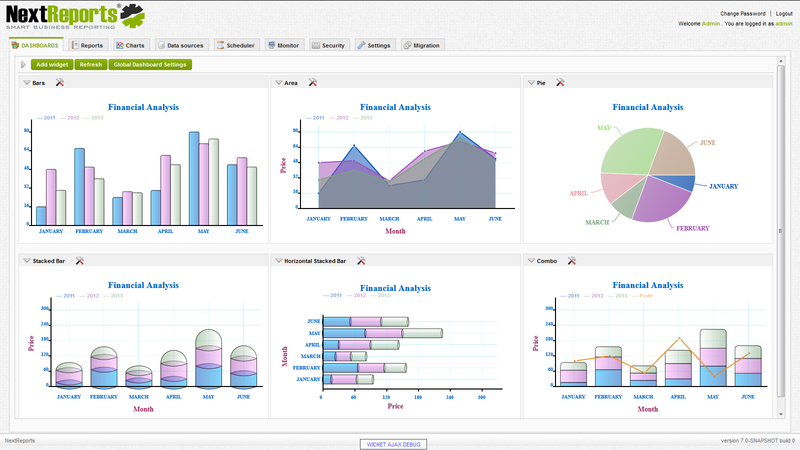 NextReports 7.0 will bring a new chart library called NextCharts. It is a simple HTML5 library created to fulfill the needs of our open source product. Before it, NextReports used a flash library called OpenFlashCharts. It was a very good free library which served well our purposes. But because flash support is loosing ground in recent software development, it was time for us to build from scratch a new HTML5 library which also allows for other OS smooth integration like Android systems. It became cumbersome to scratch your head on how to add flash plugin on some Android devices. 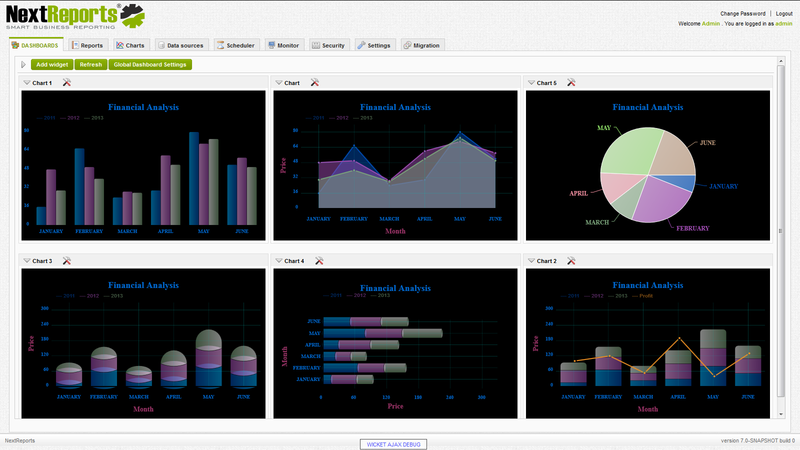 NextCharts will support all the features NextReports used in chart layout, no compromises were made. Starting from here, it will also allow us to grow the number of chart types. For version 7.0 you can have horizontal stacked bars, bar-line combos and stacked bar-line combos. Also stacked bars can have now any style as simple bars: normal, glass, cylinder, parallelepiped, dome. Old flash support was not yet removed, because there are some places where technology is slowly introduced and modern browsers with HTML5 support are not available. That's why if your "dinosaur" browser does not understand HTML5, on NextReports Server you will automatically see a flash chart. (you need to have the flash plugin). That's why in designer you will have both HTML5 and flash previews. 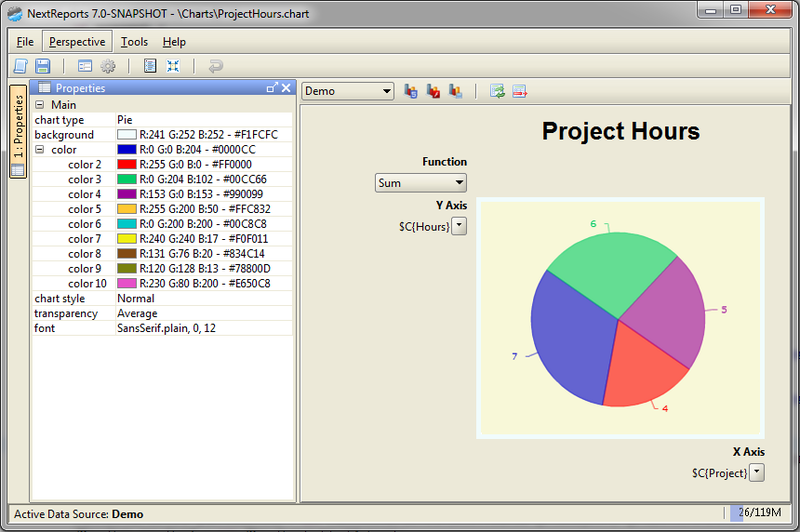 When user creates the chart in designer, he can choose to preview as HTML5, flash or image. If browser version is not a problem, users can forget about flash. Newer chart types do not have a correspondence to flash, so if you are stick with flash, you are stick with the old set of chart types. Stay tuned! NextReports 7.0 is coming soon! I have read your blog and I gathered some needful information from your blog. Keep update your blog. Awaiting for your next update.